A simple, joyful expression of love at all hours and through all seasons. In short, rhyming verses, a doting parent professes love for his or her toddler all through the day and night: “I love you in the morning at the start of every day. // I love you in the evening when sunshine goes away. // I love you when the stars glow in the dim moonlight. // I love you in the silence that comes with every night.” In the verses that follow, the narrator continues in this vein, describing his or her love for the child in spring, summer, winter and fall, ending with: “Let’s watch the world together, in rain, or snow, or shine. 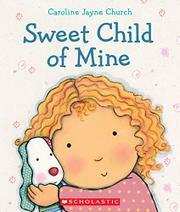 // I love you always and forever, sweet child of mine.” The endearing, cartoon-style illustrations feature a blond, curly-haired Caucasian girl and her stuffed bunny sidekick in appealing yet uncluttered natural scenes, with the narrator/parent never pictured. Both the text—with brief lines that scan well and read smoothly—and the illustrations are well-suited to the toddler crowd.